Over the course of history, mankind has used many different methods to tell their stories. From fables around campfires, drawings on cave walls, Shakespeare’s stage plays, audio records like Jeff Wayne’s War of the Worlds to books, movies and, even oddly enough, Twitter. One of the more popular ways to express a plot in the modern age now is through gaming. While balancing the interactive medium between gameplay and narrative has been commonplace for decades now, it’s always interesting to see the many different forms a plot can be expressed through the source material that the author decides to tell it through. However, it’s not always the method of how a story is told that makes for a unique experience, it’s the way a plot can be fed to us in such interesting and diverse ways that make room for new options to be experimented with. Take the movie Locke, for example, a short story starring Tom Hardy whose tale unfolds in real time and was completely filmed inside his car. The interactivity between the main protagonist and the supporting cast members across the phone’s loudspeaker feels close to home, yet works incredibly well to drive the immersion forward. Three Fourths Home: Extended Edition is very much like an interactive take of Locke. The whole thing is set in a car with our main protagonist, Kelly, trying to rekindle her relationship with her family that she left behind in pursuit of new beginnings. The main story takes place during a drive home with our main lead trying to break the ice with her family in an effort to make her arrival feel a little less uncomfortable. The day that Kelly decides to make her way back to her family happens to be the day a rather intimidating hurricane rears its destructive head across Nebraska – the place where Kelly’s familiar, yet distant, nuclear family roots lie. Your only interaction with the story is pressing on the accelerator of your car, and choosing paths to where you want the conversation to lead. To call Three Fourths Home: Extended Edition a game is pushing it a fair bit. 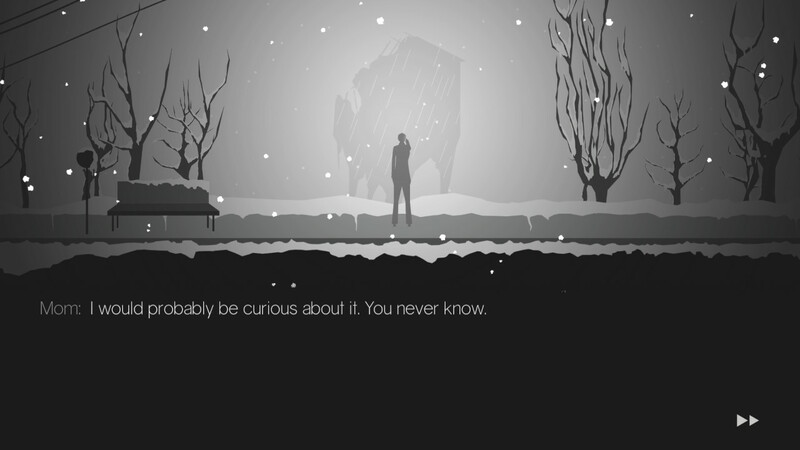 It is an interactive story that’s more like a fly on the wall drama if anything. The intriguing story aims to make you feel invested, as the personality of each of the four characters is fleshed out based on the choices you make in conversational branches. It’s a story that wants you to read between the lines, and leaves you filling in the gaps with your own interpretation on how these characters face the harsh reality of life and circumstance. Take Kelly’s younger brother, Ben, for example. A keen writer and far more talented than he should be based on the sense you get from his age. Yet despite being in the comfort zone when crafting the thing that he is obviously good at, there are other areas of his characteristics that he tends to struggle deeply with. While a story like this can be done in any medium, Three Fourths Home: Extended Edition makes good use out of the interactive technology usually catered for gaming. The comforting hum of the engine mixed with the turbulent sounds of wind and rain had me drifting off several times late at night when I decided to pursue this story. It gave me a sense of driving a long distance and how easy it can be to fall asleep behind the wheel. The subtle rumbles in the Joy-Con to represent each churn and the thunder cracking, as well as the repetition of passing large cornfields, really didn’t help the matter either. With a pair of headphones on and the screen of the Nintendo Switch 12-inches from your face, it was like reading an interactive book that plays on your senses. Being the ‘Extended Edition,’ there’s also another story to delve into. This is an epilogue to the main story that opens up once you have finished it. Set in Minnesota several months before the drive home, Kelly is on foot this time, and finally getting in touch with her Mother. It’s a relevant companion piece to the main story and extends the whole package that, in itself, will last you under two hours in total. Of course, you could always replay the tale again and see the other directions where the conversations can lead, that is if it immersed you enough the first time around. I’m really not sure how a title like this will generally appeal to Nintendo Switch owners given its usual gaming nature. Although the hybrid console is blatantly flexible enough to provide such a diverse array of experiences, with Three Fourths Home: Extended Edition, to me, it seems to a better fit on the portable home console than it would be sat at a PC or in front of a television. The intimacy of portable play just suits it better. Just understand that this particular experience isn’t suited for everyone though. Treat it like a piece of performance art if you will. Three Fourths Home: Extended Edition is a different experience to many of the offerings that the Nintendo eShop has to offer. It doesn’t quite hit the emotional hammer that something like Last Day of June does, but it’s all very well written enough to be able to take a common piece of cake from it. I do think it’s a very hard game to review as it’s not a game in any way, shape or form in the conventional sense. If I was to see it as a game, it would be a terrible one. But, as a way to tell a story, it’s certainly effective enough to work as intended.